We recommend checking out our discussion threads on the InFocus JTouch INF7001a 70" Full HD 1080p INF7001A, which address similar problems with connecting and setting up Commercial Monitors InFocus. The user manual for the InFocus JTouch INF7001a 70" Full HD 1080p INF7001A provides necessary instructions for the proper use of the product A/V Presentation - Commercial Monitors & Displays - Commercial Monitors. 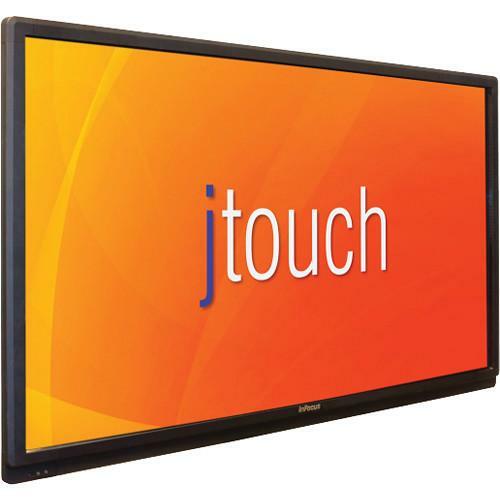 Display interactive 1080p content in your business environment with the JTouch INF7001a 70" Full HD Multi-Touch Commercial LED Monitor from InFocus. This display features a 350 cd/m² brightness output and is endowed with a 70" LED backlit panel. With a 1920 x 1080 native resolution, the INF7001a can display vivid Full HD images. This display supports touch gestures thanks to its 5-point multi-touch capability. The 4,000:1 contrast ratio showcases black colors on-screen. A 120 Hz rate is on-board for reducing distortion on fast-moving images. This commercial monitor is suitable for use in environments such as board rooms and educational settings. It also features VGA and two HDMI ports for interfacing a variety of video sources. As an added convenience, a VGA cable is included. Dual 7W speakers are also built into the display for audio playback. This monitor is compatible with 400 x 400 VESA mounts for wall placement. If you own a InFocus commercial monitors and have a user manual in electronic form, you can upload it to this website using the link on the right side of the screen. Box Dimensions (LxWxH) 74.0 x 45.0 x 10.0"
The user manual for the InFocus JTouch INF7001a 70" Full HD 1080p INF7001A can be downloaded in .pdf format if it did not come with your new commercial monitors, although the seller is required to supply one. It is also quite common that customers throw out the user manual with the box, or put the CD away somewhere and then can’t find it. That’s why we and other InFocus users keep a unique electronic library for InFocus commercial monitorss, where you can use our link to download the user manual for the InFocus JTouch INF7001a 70" Full HD 1080p INF7001A. The user manual lists all of the functions of the InFocus JTouch INF7001a 70" Full HD 1080p INF7001A, all the basic and advanced features and tells you how to use the commercial monitors. The manual also provides troubleshooting for common problems. Even greater detail is provided by the service manual, which is not typically shipped with the product, but which can often be downloaded from InFocus service. If you want to help expand our database, you can upload a link to this website to download a user manual or service manual, ideally in .pdf format. These pages are created by you – users of the InFocus JTouch INF7001a 70" Full HD 1080p INF7001A. User manuals are also available on the InFocus website under A/V Presentation - Commercial Monitors & Displays - Commercial Monitors. Can you send me a quick tutorial on how to calibrate the touch feature? The touch feature on my J-Board is off and I keep clicking things I don't mean to!